Here are the top reasons why you should buy the October 2015 issue of Forbes Philippines. Did you know that behind Oishi, the wildly popular snack food brand in Asia and beyond, is a Filipino? 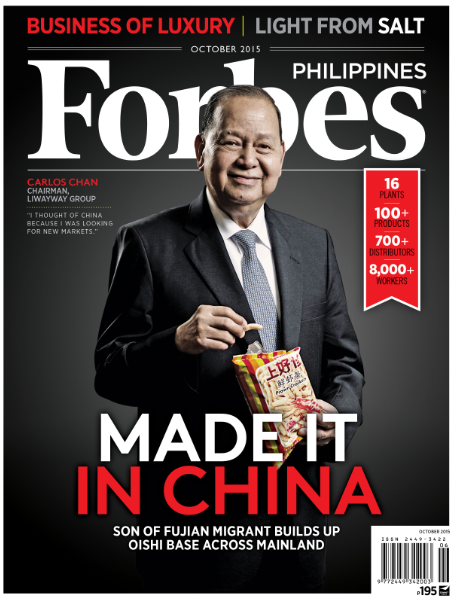 The success story of Carlos Chan, chairman of Liwayway group, which has factories all over China, in various areas in the Philippines, India, Thailand, Indonesia, and more, is the main feature in the October issue of Forbes Philippines. Learn more about his early mover advantage in China, and how foreign investors waited and learned from Liwayway’s moves. The business of luxury is also in the spotlight this month. Understand the luxury car market through the experience of PGA Cars, owned by the Coyuitos. Much of Robert Coyuito Jr’s wealth (No. 12 in the Forbes list of richest Filipinos) is now coming from a savvier and sophisticated market among the country’s social and business elite, driving the sales growth of premium European automobile brands Audi, Porsche, Lamborghini, and Bentley. Lucerne’s experience is similarly profitable. The high-end watch distributor and retailer is now in the hands of third generation Yao family who has been in the local market since the 1980’s. Know what brands are doing well and why the Yaos’ have a tight 80% grip of the local market. Dedon, the international outdoor furniture brand, has gone beyond luxury. Founder Bobby Dekyser shared with Forbes Philippines his other passion: a four-hectare resettlement site in Cebu, where Dedon has a factory. These and more in the October 2015 issue of Forbes Philippines. It is now available at newsstands and bookstores nationwide.